Nancy Cook was born on August 26, 1884, in Massena, New York. She attended Syracuse University, where she became an avid supporter of woman's suffrage and campaigned for protective labor legislation for women, the abolishment of child labor, and world peace. After graduating in1912, she moved to Fulton, New York, where she taught art and handicrafts to high school students from 1913 to 1918. At Fulton, she became reacquainted with Marion Dickerman, whom Cook first met in a Syracuse boarding house for students. The two women would become lifelong partners, living together almost their entire adult lives, sharing a life dedicated to politics, education, and progressive reform. When World War I erupted, Cook's respect for Woodrow Wilson's vision overcame her strong antiwar sentiments and she, with Dickerman, threw herself into war-related activities, especially working with the Red Cross and for the Liberty Loan drive. As Dickerman later recalled, she and Cook "really believed this was a war to end wars and make the world safe for democracy." In early spring 1918, the two women traveled to London to assist the women-staffed Endell Street Military Hospital and "scrub floors or perform whatever other chores were required." (1) Within months, both women had become nursing orderlies in overcrowded critical care units and Cook, after only twelve days of training, had begun to make artificial limbs for soldiers disabled by the war. New York women had won the right to vote while Cook and Dickerman were abroad. When they returned to Fulton, they were stunned to learn that the progressive Joint Legislative Conference had nominated Dickerman to challenge an antiwoman suffrage Republican leader in the state assembly. Cook managed Dickerman's unsuccessful bid for the New York State Assembly so skillfully that despite Dickerman's defeat, Cook's organizational abilities drew the attention of party leaders determined to increase the Democratic women's vote. Cook, who had never been fond of teaching, quickly left the profession when Harriet Hay Mills, chair of the Women's Division of the New York Democratic Party, asked Cook to join her staff. Cook would serve the party as executive secretary of the Women's Division for nineteen years, playing key roles in Al Smith and Franklin Roosevelt's gubernatorial and presidential campaigns. Cook met ER first over the telephone, when Cook urged ER to headline a fund-raising luncheon Cook was coordinating for the Women's Division. ER accepted, even though she had never given a speech before that large an audience. They met face to face after the luncheon when ER sought Cook out to give her a bouquet of violets. She then invited Cook and Dickerman to visit Hyde Park that summer. 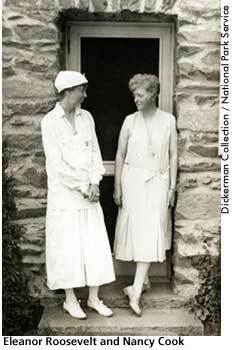 Soon Cook and Dickerman became frequent guests of the Roosevelts, often joining them for picnics on the estate grounds. By 1925, the three women, with FDR's great encouragement, built Val-Kill, a stone cottage on the banks of the FallKill creek. Cook and Dickerman made Stone Cottage their home and Cook, an expert woodworker, made all the cottage furnishings. Towels, linens, and various household items were monogrammed EMN, intertwining the three women's initials. In 1927, Cook helped start Val-Kill Industries, whose day-to-day operations she would manage until the business closed ten years later. When ER became committed to redeveloping Arthurdale, West Virginia, she asked Cook to work with the subsistence homestead program. Cook and ER oversaw the interior needs of each Arthurdale house while Cook temporarily administered the furniture and woodworking projects of Arthurdale's Mountaineer Craftsmen's Cooperative Association. Yetm as close as the three women had become, rifts were developing. Thrilled with FDR's victory, Cook and Dickerman could not appreciate ER's great anxiety over moving into the White House. By late 1933, as ER's responsibilities introduced her to a wider world and her interests and friendships expanded, she had less time to spend with Dickerman and Cook. ER's world expanded as Cook and Dickerman's shrank. By 1936, when Val-Kill Industries dissolved, ER moved out of the Stone Cottage she shared with Cook and Dickerman and had the factory building remodeled for her private space where she could entertain without imposing on or involving the two women. In 1947, Cook and Dickerman sold their interest in Val-Kill to ER and moved to New Canaan, Connecticut, where Cook lived until her death on August 16, 1962. Kenneth Davis, Invincible Summer: An Intimate Portrait of the Roosevelts Based on the Recollections of Marion Dickerman (New York: Atheneum Press, 1974), 6. Eleanor Roosevelt to Marion Dickerman and Nancy Cook, December 29, 1938, AER Papers, Franklin D. Roosevelt Library. Quoted in Blanche Wiesen Cook, Eleanor Roosevelt: Volume Two 1933-1938. (New York: Viking Press, 1999), 530. Cook, Blanche Wiesen. Eleanor Roosevelt: Volume One, 1884-1933. New York: Viking Press, 1993, 319-327. Cook, Blanche Wiesen. Eleanor Roosevelt: Volume Two, 1933-1938. New York: Viking Press, 1999, 136-7, 360-2, 526-37. Davis, Kenneth. Invincible Summer: An Intimate Portrait of the Roosevelts Based on the Recollections of Marion Dickerman. New York: Atheneum Press, 1974, passim. Lash, Joseph P. Eleanor and Franklin. New York: Signet, 1971, 623-7.